I like the site with all the details of burials in Thorpe Thewles. Do you have any information on Henry Ramshaw Smith who is listed in your graveyard survey? My family tree has my paternal grandfather as living in Crook and other places in Co. Durham. He had several children, three of which have the middle name Ramshaw. This has puzzled us as it is only the three of nine, and there does not seem to be order or reason why, the children named are separated by other children and my grandmothers maiden name was not Ramshaw. 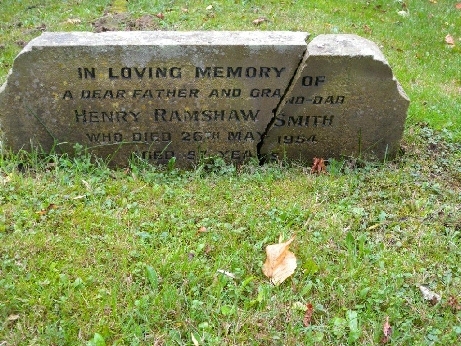 The Henry Ramshaw Smith in your graveyard fits the year of birth of my uncle Henry (Harry). I should say that I never met any of my father's parents or any uncles as we moved after the war. I met one sister whose grandson is a councillor on Darlington borough. This is what is listed for Henry's grave marker in St. James' Church yard, Thorpe Thewles as based on the database entry from our 2010 graveyard survey. I can send an image of the gravestone if required or post it on our web Forum. Grave marker Inscription: In loving memory of a dear father and Grand-dad. Grave Marker Material: Sandstone; legible but with a crack. I can now search Durham Records Office for his death certificate. Any help would be appreciated. We have family tree information on Smith, Scaife and Drew. These are the three main names which we work from but there are many more links. Obtaining the death certificate of Harry will only add the causes of death and the name of the informant to what you already know. The local death register is at Stockton not Durham as Harry's death was registered in Durham South Eastern registration district. Harry's parents Robert Thomas and Edith (nee Ramsbottom) married in Auckland registration district between Oct and Dec 1885 (by 1911 census they had 11 children - three of which had Ramshaw as a middle name). Robert Thomas was baptised in Esh in Feb 1853 his father Walter William Smith was a labourer (mother Sarah) both parents where from Norfolk. Family where living in the tile sheds. Edith Ramsbottom was born in Crook the daughter of Edward and Mary Jane both of which were of Co. Durham. As promised please find an image of the grave stone from our grave marker survey data base.